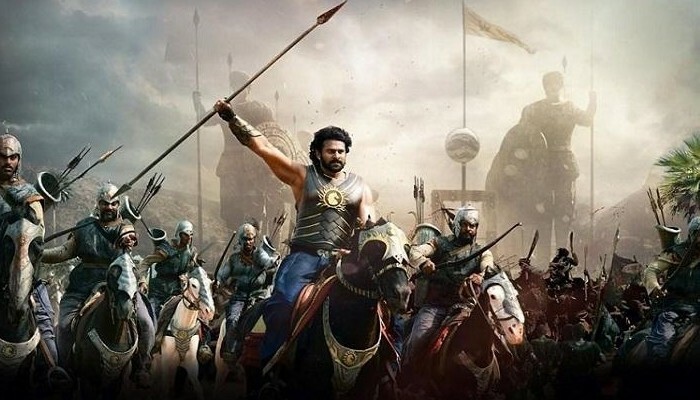 Baahubali – The Conclusion (Review): The very first shot, of title’s extreme close-up which zoom out to show the whole title, itself impresses, which is followed by the title sequence that shows 3d image of major points from the story of part one. From the very first moment, you can see the fantastic colors and the amazing visuals. I got hooked. It is an extremely rare thing that a movie is made which meet it’s prequel’s quality. Baahubali – The Conclusion even out shines the massive expectations surrounding it. The introduction scene of Amarendra Baahubali (Prabhas) has some shots with elephant that will give you electrifying effect especially when he stands on the elephant. What a great morning! Every scene is beautifully crafted. I loved the way how the film sped up and slowed down at some certain key moments. Why Kattappa killed Baahubali is just a reason for visiting the battle place of Baahubali and Devasena! This in no way ruins the film! This is a movie that gets your adrenaline going. Sometimes I had to hold myself back not to scream out loud “wow”! The images are consistently breath-taking. It’s a masterpiece of visual effects, color, sounds, and soundtracks. It will be regarded as another milestone in the history of Indian cinema. The battle scenes are so well done and breathtaking. The action is over the top, epic, and frenetic, it is gory, but artistically gory, if that makes any sense. The film works perfectly on the cinematic level. Even though I am still a bigger fan of the action scenes from Part One, Part Two is no less than mindblowing. I missed that amazing battle scene of Baahubali and Bhallala Deva with Kalakeyas. Anyway, in Baahubali – The Conclusion, the battle scene at Devasena’s fort is remarkable. I had chills and goosebumps virtually the entire film. Despite few avoidable flaws this is a truly memorable movie. Baahubali –The Conclusion is filled with mesmerising and memorable ‘mass’ sequences. There were moments where the music set in and shivers and adrenaline were running throughout my body. What an amazing achievement! I’m definitely longing to see this movie again. Believe the hype; Rajamouli has delivered a film that will undoubtedly stand the test of time. S.S. Rajamouli’s filmography is far from a list of box office hits, it is a list of blockbusters and mega films; SS Rajamouli is responsible for some of the most successful technologically advanced cinema India has ever seen. From ‘Magadheera’ (2009) to ‘Eega’ (2012), from ‘Baahubali’ (2015), he has always strived for more than the average Indian mass-movie-director, and his latest, ‘Baahubali – The Conclusion’, follows that same path. The film is designed with heavenly landscape, massive buildings, picturesque clouds, stunningly beautiful waterfalls and jaw-dropping mountains. Rajamouli knows how to properly use the massive budget. Baahubali – The Conclusion’ is an ultra-brilliant package of film-making mixed with Indian masala. It’s utterly gorgeous.